As a special service for people new to the Clueless Special, here is an introduction to this format. This page contains an easy Clueless Special, which you can solve with singles only. A Clueless Special has 9 constituent Sudokus. You can try to solve these puzzles on their own, but you won’t get very far. At some point, you need to pass results from one puzzle to the next. Here’s where the blue cells come into play. Together, the central 3x3 boxes of all 9 Sudokus form a 10th sudoku. The name of this format is derived from the fact that you will not find any initial clues in this 10th puzzle. It is completely clueless. Start with the clues you receive from the 9 sudokus. Even if you prefer to solve regular Sudokus without pencilmarks, the sheer size of a Clueless will not allow you to remember all eliminations. 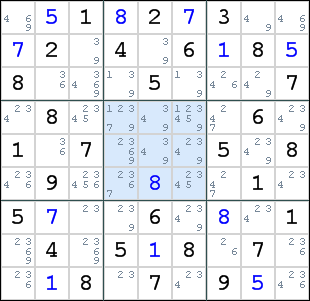 You can maintain the pencilmarks for the central sudoku in a separate grid. Take the first sudoku in the starter, for example. On it’s own, you can only solve 17 cells, none of them in the center box. To achieve this, you need several locked candidates, naked pairs, a hidden quad and an X-wing. Brilliant if you manage to find them, but not effective. A better strategy is to work out the pencilmarks for the central blue 3x3 box. This is the second puzzle (top row, center) solved with basic techniques as far as it goes. There may be more eliminations when you go all the way and use any advanced technique at your disposal, but as I said, that is not the way to solve a Clueless Special. Notice that you now have some useful data in the blue box. Pencilmarks are worked out and you even have a placement of a digit 8. Repeat this for each of the 9 puzzles, then start adding things together by looking at the 10th puzzle that is made up of the 9 blue boxes. Because a 3x3 box in a constituent puzzle is also a 3x3 box in the 10th puzzle, there is no need to look for hidden singles in these boxes again. Concentrate on the rows and columns in the central puzzle. There is a hidden single for digit 1 in the 3rd row. When you cannot find any singles, you may need the boxes to find locked candidates in the central puzzle. Eliminations done in the central puzzle can also be fed back to the constituent puzzles to reveal singles and other goodies. Make sure that you correctly pass the results between the central puzzle and the 9 constituent puzzles. An error is easily made and hard to detect, until you get stuck hours later. You may have to move back and forth between the 10 puzzles a few times, before you have solved them all. Show the solution for this puzzle.